Around this time last year Kiwi and I headed down to Kings cross and hopped on the Eurostar to Cologne, Germany. 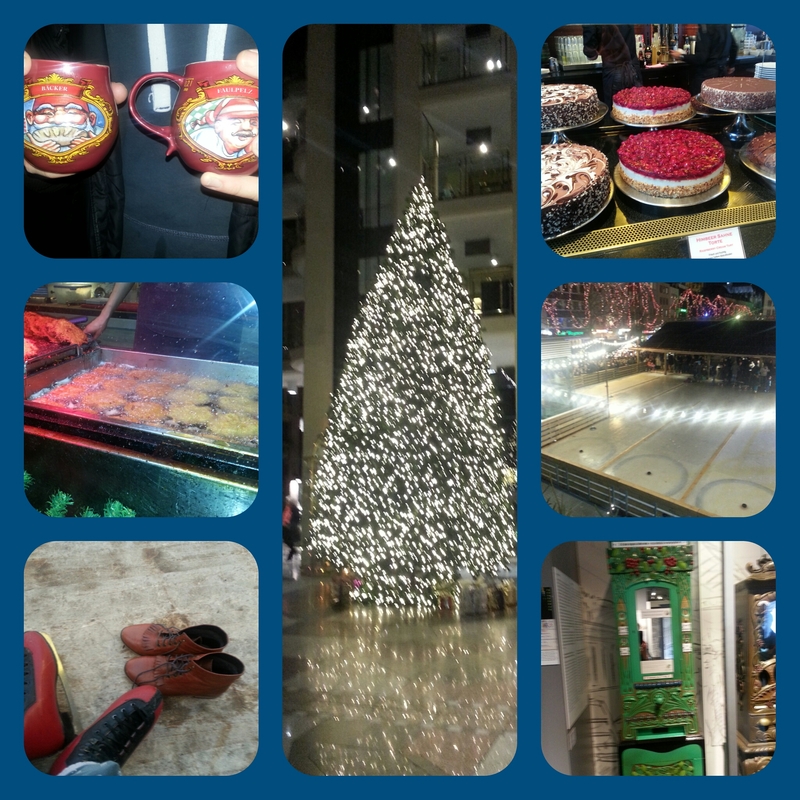 This was for a few days to visit the German Christmas markets! There are a couple of local Christmas markets in Oxford, South bank, London and Birmingham that we had previously popped too which are brilliant fun. There are usually stalls decorated with twinkly lights, mulled wine and a variety of Christmas gifts like cheese, soap, textiles and crafts. After hearing good things we thought we would take a visit to the original Christmas markets and they didn’t disappoint! We arrived in Cologne, it was chilly and icy with snow dotted around. Cologne is incredibly pretty, with the main streets surrounding Cologne Cathedral and market places sprawling along the river Rhine. There is also a massive Christmas tree and plenty of live Christmas music. We checked into a very lovely hotel -Art’otel – and set to exploring. We visited 5 markets, all similar but with different stalls, Initially we set about eating our way around Neumarkt, Cathedral and Alter markets, then drinking our way through the Gluehwein. There were fleishsticks – sticks of bbq’d meat that were pretty tasty, waffles, and apple fritters – which became a firm favourite! At the chocolate/Harbour market there were all manner of items dipped in chocolate, strawberries, fruit sticks, biscuits and marshmallows, as well as chocolate themes gifts. This was next to the chocolate museum which we visited. The highlight was seeing a gigantic gold Lindt bunny! taste testing and the old chocolate vending machines, and impressive cakes. We loved the Gluehwein and set about collecting the various mug designs – there are different colours for each market with different designs. Once we had a small collection we actually started buying refills as we only wanted to keep a few mugs. The markets themselves have lots of cuckoo clocks, beer, wooden toys and jewellery. We watched some curling and went ice skating and found some glass Christmas tree decorations to take home. 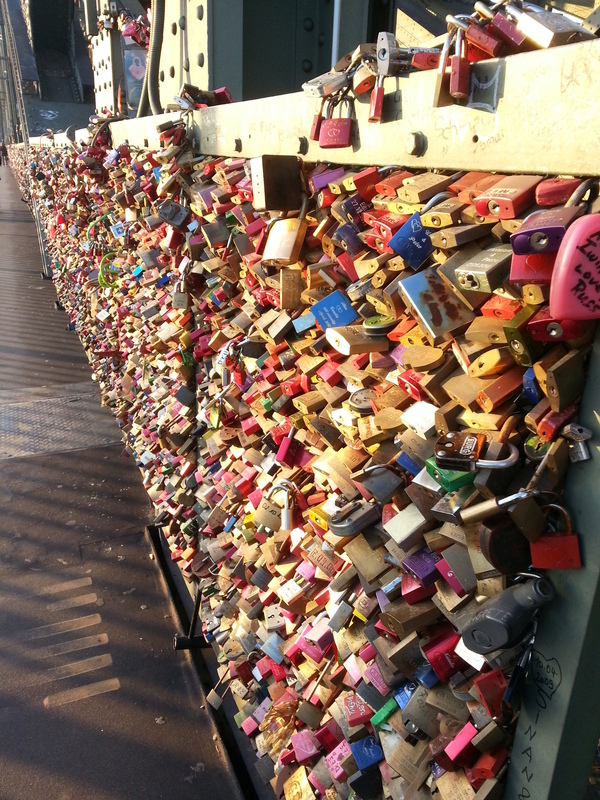 We also visited the love locks bridge which made for some colourful photos. The few days spent in Cologne were lovely – probably very touristy but it certainly put us into the Christmas spirit. If you get chance to visit its highly recommended! Or check out your local Christmas markets, have a mulled wine or cider, and soak up the Christmasness, tis the season!